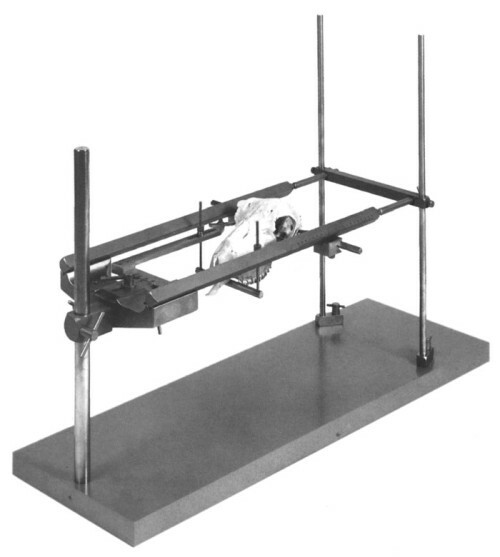 Model 1630 Large Animal Stereotaxic is a large, heavy-duty instrument designed for proper stereotaxic placement of large research animals. While primarily constructed for sheep and goats, this instrument can be modified for use with large dogs, monkeys and other large animals. Model 1630 Frame Assembly with one set of ear bar locators is fixed to an ultra-heavy Universal Clamp which is mounted on a 1″ diameter Stand Post. Outboard ends of the A/P bars are mounted on 12.7 mm diameter Vertical Outboard Posts, which are secured at the ends with a tie bar to stop any vibration. Model 1655 Sheep / Goat Adaptor locates the animal firmly and accurately by means of tapered ear bars which fit into the external auditory meatus. Adjustable infra-orbital clamps and a vertically adjustable palate bar prevent rotation of the skull. Model 1654 Standard Solid Ear Bars included (9.4 mm square with 50 mm calibration). This complete unit is mounted to an aluminum base plate with four rubber feet to help dampen vibration. Frame bars are extra long with wider A/P centerline distance necessary for larger animals. Manipulators can be mounted from either side end of A/P bar. Look below under Optional Accessories for Stereotaxic Manipulators that are sold separately. Click here for a complete list of stereotaxic accessories.